After lasting longer than many thought it would, Rize Artisan Pizza + Salads has closed its second and final location. The restaurant, located in the street level retail of the new Square One apartments at the corner of Roswell Road and Hammond Drive in Sandy Springs, reportedly closed earlier this week and was cleared out hours later. Sources close to the restaurant say that the eatery was evicted by its landlord, Crim & Associates. 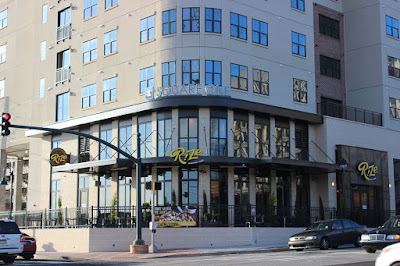 The first Rize opened on Highland Avenue at the 675 N Highland apartment complex in November 2016 and had closed by August 2017. The Sandy Springs location, which was originally expected to open first, did not open until March 2017. A third location planned for Dunwoody never opened. The closure of Rize in Sandy Springs comes on the heels of the opening of MOD Pizza, a similar concept, this past January at The Plaza at City Springs on the site of American Pie, about two blocks south of Rize. Later this fall, The Local Pizzaiolo, another similar concept, is expected to open at the new Modera Sandy Springs apartment complex, just north on Roswell Road at Hilderbrand Drive. As we reported in August, Rize's days were numbered after losing their private equity funding over the summer and with few people experienced in leadership roles running the restaurant. Both John D. Smith and Ryan Coppola held management roles with Caesars Entertainment Corporation before getting involved with Rize. Both now have new jobs. Smith, who was CEO of Rize Holdings, LLC until July 2017, quietly became COO of Atlanta-based Aaron Rents this past January according to his LinkedIn profile. Coppola, who was Vice President of Operations for Rize until September 2017, became Vice President of Non-Gaming at Penn National Gaming and Hollywood Casinos in Lawrenceburg, Indiana as of this past October, according to his LinkedIn profile. Eddie Russell, Director of Culinary Operations, left Rize in November 2017, according to his LinkedIn profile. Despite having no prior restaurant experience, Peter deWeerdt, "Digital Technology & Consumer Analytics" for Rize, later led the restaurant. Amazingly, the most recent Yelp.com review the restaurant received came on March 7 from user "BAba S." who gave the restaurant five stars and said of Rize "Best Pizza in Atlanta!!! Best Pizza Ever!!!" The restaurant had an overall rating of four stars on Yelp, having received a total of 100 reviews. The 3,585 square foot restaurant is currently being offered for lease by local brokerage Skyline Seven. While we have heard nothing definitive, Fresh to Order was originally slated to open in the Square One development but never did. F2O could now walk in to a fully built-out restaurant and may be interested in taking over the space. Are you surprised that Rize didn't work? What is your favorite quick-serve pizza restaurant? 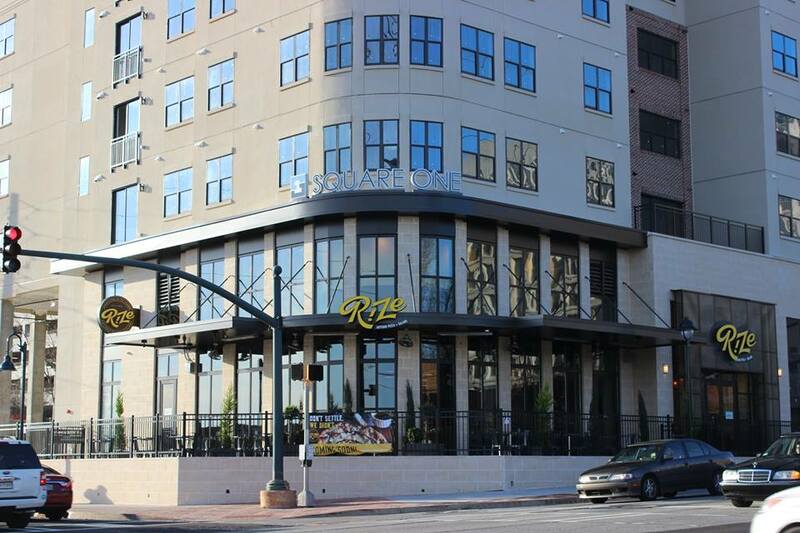 What would you like to see open in place of Rize at Square One? I’m not surprised at all given to the limited parking and people would have to often park across the street at Whole Foods and walk across the street. I prefer Your Pie as a quick serve pizza place. I went to the opening preview at the Ponce location. This venture was doomed from the beginning. It is a shame because the food wasn't bad, it was on the healthy side and well priced. The primary issue was that they forced their wi-fi ordering on the customers, which made ordering food confusing and inconvenient. They were creating problems through their use of technology, not solving them. Plus you didn't get a dedicated server. The staff was supposed to wander around and help everyone (what could go wrong!). They poured a ton of money into this place, what a shame. LOL anytime something fails, the first thing people point to is parking. Are we that dumb as a city that we can't figure out how to park in something other than a big sprawling lot? It's not that people are dumb and it's not like Rize had a sprawling lot. People are LAZY and Rize had limited parking within two decks, one adjacnet to the restaurant, one further away. I feel awful for businesses when they fail. I wish them luck on their next project. I live in Memphis now, we have Pyro's Pizza - a similar concept. It's very good and really popular here. It's locally owned. Many of the chain pizza places are not doing as well here - for example, PizzaRev. I grew up in Marietta and love this blog, it's fun keeping up with what's going on in Atlanta. I think we're just gonna have to wait until everything that Sandy Springs has coaxed into its midrise future in that corridor is fully built out. I don't see how the retail works until the residential is done and full. Sandy Springs is far from being a walkable city and until that changes, the daunting task of trying to park under a high rise on one of the busiest intersections in the area isn't worth it. This isn't L.A. where everyone is accustomed to valet and its far from NYC with its public transportation situation. Until driverless cars can prove that they won't kill people, Sandy Springers will prefer a sprawling parking lot. The fact Rize had Valet was why I never went. It is a pizza place, no matter how you cut it, not a high end steak place. Just sayin'. Not sure why restaurants bother with valeting as I find it an inconvenience as I can park and leave quicker than my car being found and driven to me. You are so kind Farzana! I only go to places if there is a sprawling parking lot. I go out to enjoy myself not to deal with a lack of parking.